- Turn Heat, to Movement, to Electricity, to Light! 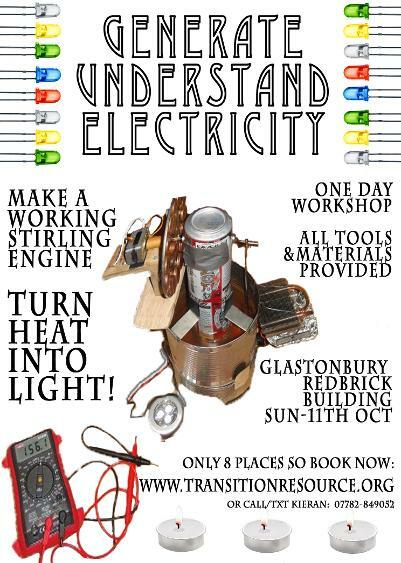 This workshop is a Reuse and Upcycling workshop and as the name suggests the stirling engine is made of completely salvageable components. We will provide all of these components apart from one essential part, which YOU have to bring with you to the workshop. YOU WILL NEED TO BRING 4 TINS/CANS TO THE WORKSHOP TO MAKE YOUR ENGINE. The workshop is led by Steve, who has taught many people to make Tin Can Stirling Engines. Steve's aim is for each participant to have a working Tin Can Stirling Engine that they can take home with them to show off to their friends as a working model power station with LED lights. The Workshop is held at the Red Brick Building Centre on the Morlands Enterprise Park, Morland Road, Glastonbury, Somerset, BA6 9FT. There are facilities and a restaurant/bar for lunch. The Workshop is on Sunday 11th of October 2015 from 10am to 5pm. There are ONLY 8 spaces available on the workshop so please do book immediately to avoid disappointment. You can pay by Pay pal by clicking on the link on the right of this page, or you can contact Kieran to arrange payment by another means. The total course cost is £65 for the whole day. BRING 4 TINS AND CANS! This workshop is NOT FOR PROFIT. Any and All profits will go to Running MORE 1 day Reuse WorkShops at the Red Brick Building. So we need to make this one a Success! Build your own Hot Water Solar Panel like the ones used on the Solar Power Shower Tower. Restore or Redesign a piece of old furniture to make it fit into your new place. Fix up that old bicycle you've had in the shed for years. Learn to Build using juice cartons. Make a TetraShack or similar structure. Make a Hula Hoop from water pipe and extras.